One of potential types of dental problems that patients allow to go untreated is tooth crowding. When there is insufficient room in the mouth for normal tooth alignment, teeth can be twisted and turned, pushed and nudged into odd positions that make smiles unattractive and bites uneven. While many people care about correcting tooth crowding for cosmetic reasons, tooth crowding also contributes to dental decay (as alignment problems make brushing and flossing areas between teeth difficult) and pressure on the temporomandibular joint, which can cause jaw problems over time. The typical treatment for tooth crowding is physical correction using either orthodontics devices such as braces or Invisalign. In some cases, your dentist or orthodontist may recommend tooth extraction or surgical correction, especially in cases where extra teeth cause crowding that is difficult to correct with simple straightening. On very rare occasions, surgery to lengthen or shorten the jaw may be required – the jaw bone can be cut and realigned, and held in place with screws and plates. While this is unusual, it’s worth knowing that virtually all malocclusions can be treated with modern dental medicine. 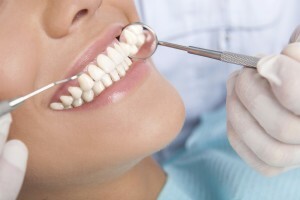 If you feel that your teeth aren’t properly aligned, or if you’re concerned that you have an over-bite, under-bite, or even a deep bite, schedule an appointment with your dentist for an evaluation so that you can be informed of the various treatment options.